I have a Warmoth 54 style P bass body (swamp ash body, maple/rosewood neck and flatwound Rotosound sm77 strings). When I built this bass I initially installed an aftermarket "vintage output" single coil P pickup, the kind commonly found on eBay for around $40 or $50. At band rehearsals, I found myself "digging in" too hard to get the output I wanted. Turning up the amp volume somehow just made it sound too loud without getting the subtle nuances I was trying to project with my playing technique. Tried out the Muy Grande '51 pickup and I must say the improvement is remarkable. I can now really hear what my fingers are doing without having to be too loud in the mix and the details of what I'm playing come through very well with minimal effort on my part. The Muy Grande '51 still keeps the desirable tone of a vintage output single coil P pickup, perhaps adds some low/mid thickness but highs stay bright, and there is some lovely 60 cycle hum but not where it's too much. I can best describe this pickup upgrade as reading a newspaper in a typical room, then turning on the lamp next to you and suddenly it's "oh yeah it's the same newspaper but I can see much better now". 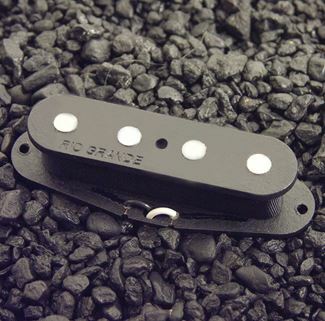 I'm guessing this pickup would be a real home run for most any player with one of those Vintage Vibe or Sting basses.